We find ourselves spending a lot of time on Instagram, guilty! Before we take a trip we like to browse Instagram looking for things to do, places to eat, where to get the best coffee, etc. Before our recent trip to New York City in September we were browsing Instagram a few days before we left, just like any other time and we came across Megpies! You are probably wondering what are Megpies? Megpies are natural artisan tarts that are made with quality ingredients. They are based out of New York City and we knew we had to get our hands on some during our visit. We sent Megpies a DM on Instagram after seeing they were at a local cheese shop in New York giving out samples of their delicious tarts. We asked if they had any more pop-ups scheduled and where we could find their tarts. They asked where exactly we would be visiting while we were in the city and sent back a whole list of places we could pick up some of their delicious and savory tarts. We made it a point on our trip to visit Murray's Cheese Shop (if you love cheese, you have to check this place out) where Megpies had been a few days before our arrival giving out samples. Upon our arrival at Murray's Cheese we quickly found the Megpies. Right there before our eyes were Strawberry, Blueberry, Mixed Berry, and Chocolate tarts. They looked absolutely delicious as their packaging shows off the beauty of the tart, rather than hiding it in some silver foil wrapper. We knew we would love them and since we went a little ways out of our way to get them we decided to buy three mixed berry and three strawberry to take home with us. They didn't last long once we got home since we couldn't wait to break into them. Upon the first bite we knew we were fans of these delicious, flaky and fruit filled pockets of joy. Megpies come in five standard flavors; Strawberry, Mixed Berry, Blueberry, Chocolate and Cinnamon & Brown Sugar. The best part is they can be ordered online on Megpies website. Each flavor is available for purchase in a 4-tart or 12-tart box or if you want to try them all you can order and several different assortment's. If you just can't wait to get your hands on one of these artisan tarts you can also check your local Starbucks. 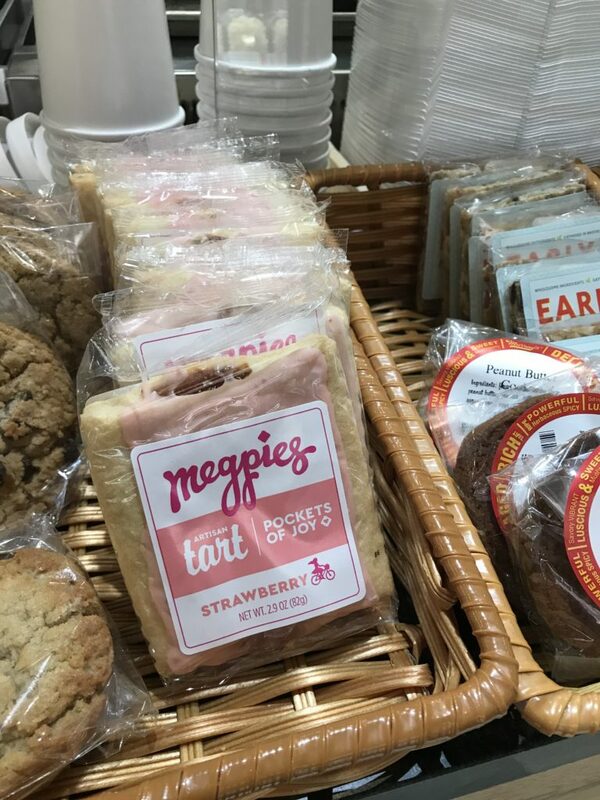 Select Starbucks locations carry Megpies. We have checked 5 different Starbucks near us and only a couple of them carried them, so good luck! Some people might compare Megpies to toaster pastries, but really there is no comparison. Once you try a Megpie, you will know exactly what we are talking about.